“I’m on Twitter to promote the ancient art of letter writing,” says Annemarie Buckley a bit ruefully. The irony of using new media to peddle the old isn’t lost on Buckley, the 30-year-old designer behind Scout’s Honor Co. In the age of email and text messages, the Burlington stationer is a holdout for the good old-fashioned note card. But the web has been good to Buckley, whose work gained traction — and customers — on several influential stationery, design and wedding blogs. 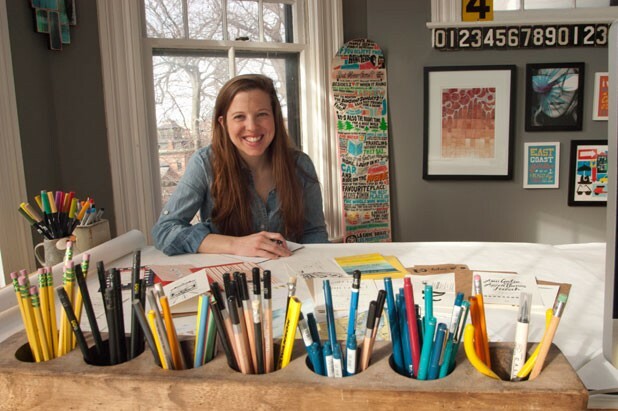 That attention enabled her to quit a full-time job at Burton Snowboards and dive headlong into the work she loves: hand lettering and drawing everything from custom wedding stationery to playful birthday cards. Buckley’s studio is tucked in the third-story turret room of her Burlington apartment, with a western view of the lake. These days, though, the studio is taking up a little more room than initially intended: Her kitchen counter is lined with custom stamps, her hallway crowded with industrial bookshelves storing stacks of envelopes and note cards. And, on an overcast February afternoon, Buckley’s drafting table is littered with wedding invitations — some finished, others works in progress. It’s crunch time for wedding season. Her bread and butter, as a stationer, are custom wedding invitations — from save-the-date postcards to hand-drawn wedding programs to place cards and thank-you notes. To work with couples at that time, when they’ve got an idea they’re hoping to bring to life, can be an exciting challenge for an artist. “Weddings to me are almost like the couture of stationery,” Buckley says. Plus, she likes knowing that she’s contributing to a family’s collection of keepsakes. She remembers, as a child, admiring framed wedding invitations that lined the walls of her grandmother’s home. Invitations of that particular vintage tended to follow certain conventions; stylistically, there wasn’t much to differentiate one from another. That’s all changed for couples today, says Buckley. Weddings increasingly are about expressing something unique or special about a couple, and wedding stationery — which arrives at a guest’s mailbox long before the actual ceremony — is often the first introduction to the event. Her pricing is customized to the project, because each client is a little different. For couples looking to save money on stationery, Buckley might design a simple postcard. Others go all out with save-the-date cards (typically sent six months or more before a wedding), custom maps, RSVP cards and thank-you notes, as well as “day of” paper goods such as menus, table numbers and wedding programs. This time of year, Buckley is busy: Save-the-dates are going out now for summer and fall weddings, with invitations soon to follow. She has trouble summing up how many hours she spends on each project, but knows this: It’s a lot. “There’s so much that hits the cutting-room floor,” she says. But Buckley says custom wedding invitations are a delightful challenge for a stationer. While her clients come to her because they like her aesthetic, their ideas often push her in new directions, or enable her to explore a concept or theme in more depth than she might in a simple birthday card. For instance, there was the couple who sent her a long list of “stuff we like” — including typewriters, trolley cars and fried chicken — and told her to have at it. Right now, she’s riffing on old-school ski posters for another couple, who became engaged after a gondola ride. Their springtime Stowe wedding invitation is illustrated in bold, graphic sweeps with evergreens and a ski-lift chair. “I was like, sick!” Buckley says excitedly. Those invitations were awash in watercolor, illustrated with a lighthouse and whimsical nautical touches. Guests received a hand-illustrated, treasure-hunt-style map of the New Jersey coast that pointed out the location of the ceremony and other landmarks. One of the problems, Buckley admits, is that guests occasionally admire the invitations so much that they’re reluctant to send back their RSVP cards. That New Jersey wedding was the big project that allowed Buckley to quit her job as a Burton content manager and launch Scout’s Honor Co. last February. Stationery was a nights-and-weekends affair for a long time before that. Buckley acknowledges that the decision was a leap of faith, but she was ready for the change. Now Buckley says she’s caught at a tough but enviable junction in her professional life: She’s swamped with work and is turning away potential clients for want of time. In addition to her wedding stationery, Buckley is selling a small line of note cards through her website and hopes to expand her wholesale business. She also creates custom stamps illustrated with a drawing of the client’s home. They’re used to make notecards or return address labels, and have proved surprisingly popular. The prototypes — everything from a Los Angeles ranch to a New England farmhouse — are collected in a tiny stamp neighborhood atop one of Buckley’s bookshelves. Even the company name — Scout’s Honor — reflects her style. “It’s harkening back to the simple things,” Buckley says. The result is crisp and bright, a playful reinterpretation of nostalgia that avoids fusty wistfulness. “The aesthetic of this state alone is so inspiring,” says Buckley, who moved to Burlington after attending college in Boston. “Things around here are kind of what they are, which I love.” If there’s a proliferation of plaid and L.L. Bean and Woolrich, she goes on, it’s because those items serve a function in Vermont — not because they’re ironic or trendy in Brooklyn. Buckley acknowledges that well-crafted and durable goods are enjoying a resurgence in popularity in the design world, and she hopes it isn’t a passing fad. “Hopefully this isn’t a flash in the pan,” she says. Buckley’s grandmothers both wrote letters “just for fun,” sending her missives at Boston University with updates on the family. She’d hate to see “legit thank-you notes” disappear. “I really do believe that if you’re making something of quality, people will use it,” she says. As a new entrepreneur in an industry beholden to blog posts and site hits, Buckley keeps an eye on what other designers are doing. But then she’ll turn off the computer and take a stroll to a local antique shop. That’s where she found the bull’s horns that are now mounted on her wall, or one of the many old books she scours for typography. “At the end of the day, it’s the physical object that inspires me,” Buckley says.